When ADHD first appeared in the DSM in 1987, 3 percent of U.S. children were thought to have the disorder. By 2000, the number increased to 7 percent. In 2014 that number jumped to an alarming 11 percent of children and 15 percent of high school students. Two-thirds of these children are on medication. In contrast, in countries like France, Finland, the UK and Japan, the number is a half of one percent, and far fewer children taking medication. 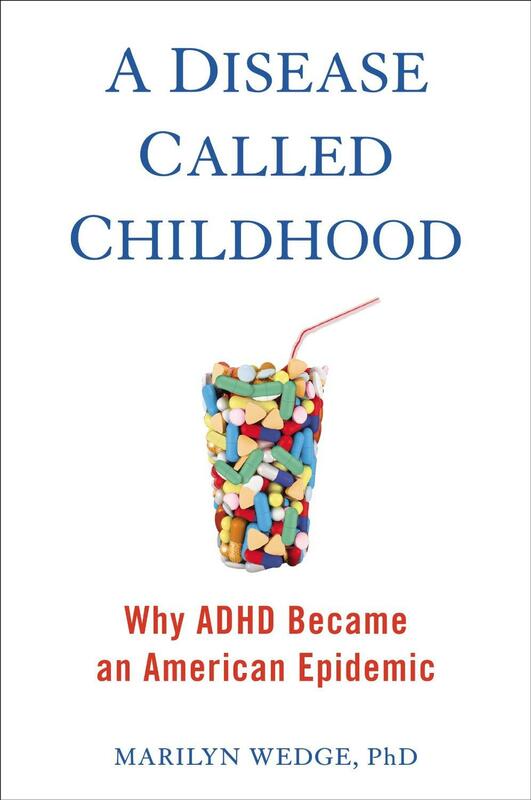 In the new book: A Disease Called Childhood: Why ADHD Became an American Epidemic, Dr. Marilyn Wedge brings together the latest developments in neuroscience and clinical research, a history of big pharma and psychiatry, and cultural studies of educational systems around the world. Among the first generation of boys prescribed medication for hyperactivity in the 1980s, Timothy Denevi took Ritalin at the age of six, and during the first week, it triggered a psychotic reaction. Doctors recommended behavior therapy, then antidepressants. Nothing worked. As Timothy’s parents and doctors sought to treat his behavior, he was subjected to a liquid diet, a sleep-deprived EEG, and bizarre behavioral assessments before finding help in therapy combined with medication. In Hyper, Timothy describes how he makes his way through school. In a study published earlier this week, researchers found that pregnant women who take acetaminophen -- a widely used drug found in such over-the-counter painkillers as Tylenol and Excedrin -- are at increased risk of having children with hyperkinetic disorders like ADHD (attention deficit hyperactivity disorder). On Tuesday, the US Centers for Disease Control and Prevention (CDC) released startling new data on the incidence of attention deficit hyperactivity disorder (ADHD) in American kids. According to the CDC, over 6 million children between the ages of 4 and 17 have been diagnosed with ADHD. Despite coming on the heels of April Fool’s Day, those numbers are no joke. Neil Gaiman, one of the world's most beloved fantasy authors, is known for his eclectic work including: The Sandman, Stardust, American Gods, Coraline and The Graveyard Book. Now he's written his first novel for adults in eight years, The Ocean at the End of the Lane - a bewitching and harrowing tale of mystery and survival, and memory and magic which makes the impossible all too real. In recent years, there have been major outbreaks of whooping cough among children in California, mumps in New York, and measles in Ohio’s Amish country—despite the fact that these are all vaccine-preventable diseases. While America is the most medically advanced place in the world, many people bypass modern medicine in favor of using their faith to fight life threatening illnesses. According to our next guest, children suffer and die every year from treatable diseases, and in most states it is legal for parents to deny their children care for religious reasons. Dr. Paul Offit is a Professor of Pediatrics in the Division of Infectious Diseases at the University of Pennsylvania School of Medicine and Director of the Vaccine Education Center at the Children’s Hospital of Philadelphia. His new book is Bad Faith: When Religious Belief Undermines Modern Medicine.